Whether clipping a power coupling with your speeder, losing your shields to a blast from an enemy ion cannon, or suffering catastrophic damage from a capital ship bombardment, vehicle and starship combat is a dangerous game. If you want to play you have to be prepared to lose it all. 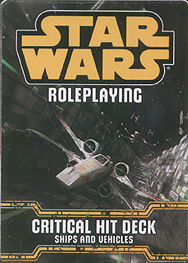 This deck requires the Edge of the Empire, Age of Rebellion, or Force and Destiny Core Rulebook and includes cards for the 19 critical hit effects vehicles and starships can suffer in the thrilling combat of Star Wars Roleplaying.